Professor Emeritus Erik Sandewall has had a pioneering role at Linköping university and the Department of Computer and Information Science (IDA), as the first professor in computer science in Sweden, and one of the founders of the department. 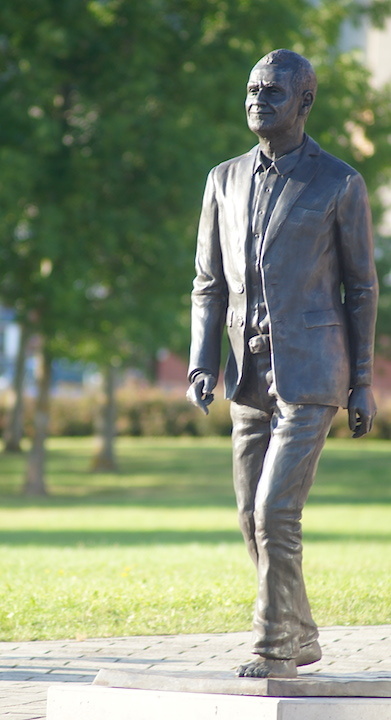 The traces left behind and the road ahead are visualised in a statue that was raised to honour Erik Sandewall and the birth of computer science in Sweden. The statue was inaugurated on August 20, 2014. Erik held a speech at the occasion: Leaving Traces — Words on the Road. Johan Malmström graduated at The Royal Institute of Art in Stockholm in 1994. He has since then worked as an artist and a teacher.